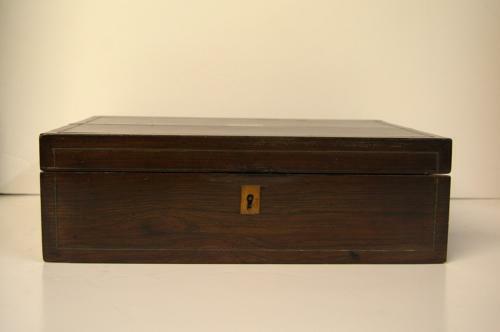 This beautiful writing box has plenty of space for your personal affairs - in fetching rosewood, with mother of pearl inlay, this is a practical and beautiful box. It has several compartments which lift and hide to ensure security, and the inside is lined with a berry velvet. We do not have the original key unfortuanately. There is also brass string inlay. All of our prices include current VAT (20%). Thanks.